Successfully Added Ultra-Sleek Digital Voice and Telephone Recorder (2GB Memory + MP3 Player + FM Radio) to your Shopping Cart. 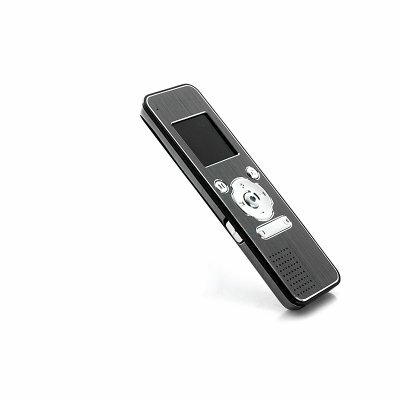 An ultra-sleek Digital Voice and Telephone Recorder that comes with 2GB internal memory and FM radio, this handy little gadget offers you one touch recording for lectures, interviews, phone conversations, etc. It also works as an MP3 player and FM radio receiver for you to enjoy hours of music and radio programs. Compared to other digital recorders, this product is thinner and feels smoother. The dark plating color and a silver rim give it a sophisticated and professional look. It’s durably constructed to stand minor impacts, so even if you accidentally drop it on the carpet floor, it will remain intact. No more fear of taking it with you everywhere you go! This multipurpose digital audio recorder can be used in lecture theaters, class rooms, presentations, telephone conversation recording, in meetings at the work place, etc. With a 2GB internal memory and super long battery life, you can be sure you'll record every second of even the longest conversation. In addition, the MP3 player function lets you load in hundreds of songs for hours and hours of listening pleasure. Best of all, the built-in speaker allows you to instantly listen to music or playback recordings - much better than certain MP3 players (cough iPod cough), which would simply leave you out of luck if you forgot your earphones! Selling at an unbelievable wholesale price, it’s much cheaper than other similar products on the market. Order one for yourself or purchase wholesale stock to sell and profit. Available from your source for high quality, low price electronics, Chinavasion. It’s a great mp3 player too!